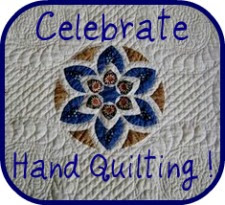 This post is for the Hand-Quilted category. I am entering Stars in Her Eyes, which I made for my lovely Nora last year. The original post about making the quilt along with more photos can be found here. Here she is: isn’t she beautiful (I mean Nora, of course! but the quilt is beautiful, too). The quilting is a simple pumpkin seed pattern with variegated thread by King Tut. I wanted the quilting to to be fresh and summery, so I didn’t want it densely quilted. This pattern suited it perfectly and gives motion to the stars. This entry was posted in Beauty, Hand Quilting, Quilts and tagged contest, creativity, hand quilting, Nora, quilting, quilts, Stars in her Eyes. Bookmark the permalink. Your quilting is beautiful and you chose the pattern really well to show off the stars. Well done! oh sew beautiful! I love the stars and the quilting is wonderful!